Breckenridge, Colorado offers endless views and sometimes endless snow, too! This adventurous bride and groom duo braved some very chilly temps and over 18" of fresh snow for their gorgeous winter elopement. Don't miss their elopement video highlights at the end! 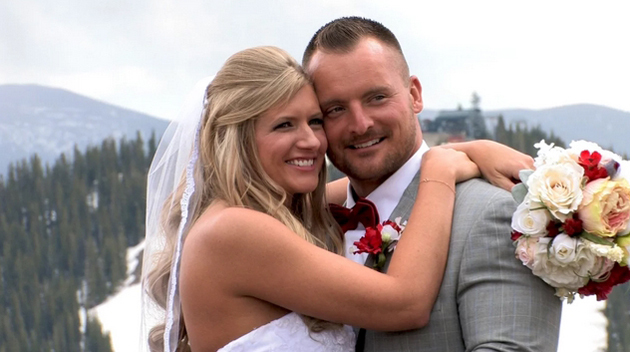 I usually post sets of pictures that have been submitted via Two Bright Lights, but today's post is a video, Holly + David: Keystone Resort Wedding at Timber Ridge, that was produced by Elegant Productions, a Colorado wedding videography company that is headed by Erin Pellant. She's super sweet and so is this video. I always recommend a videographer as still images can't capture the mannerisms, the voices, and setting the way a video can. Ask us how we can work Erin and a video into a custom wedding package for your destination wedding at Keystone, Breckenridge or any of the mountain towns in Summit County or the Vail Valley. There are actually quite a few locations to choose from when planning a wedding in Keystone, and just a few choice locations include the Alpenglow Stube and Timber Ridge duo at the Outpost on North Peak (which require two gondolas to get to), the Keystone Ranch, and the Ski Tip Lodge. Plan a rehearsal dinner at one of the spots near the River Run Village, and you'll be set. In the winter time, you'll even have a snow fort and tubing hill as part of the wedding week experience for your guests. Friends and family will be talking about your wedding for a long time. Please contact us to learn more. It was a snow spring in the Town of Breckenridge (<-- here's a map link) and all that moisture led me to explore and make this list of 7 Hiking Trails in the Colorado Rocky Mountains for Viewing Wildflowers that you have to see to believe. The slow melting process drips life into blooms that sit under tons of snow and wait until the few days that it is warm enough to fulfill the cycle one more time. It is truly an amazing thing to see, the ski slopes and mountains covered in millions, probably billions of colorful wildflowers. Part of your wedding experience for friends, family and guests could be strolling through the shops along Main Street or you might even spend some time at the Fun Park on Peak 8. Check out the new roller coaster, but the alpine slide is a summer classic in Breck. However, if you're ready with a backpack with your 10 Essentials and want an adventure, check out the videos below. They are best completed with a backpack full of everything you need, a group of energetic friends, and a camera or two. 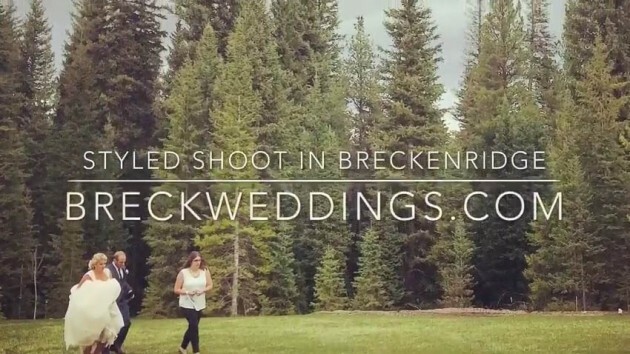 Post a few on our Facebook wall, and be sure to use the hashtag, #breckweddings on Instagram so that everyone can see all the fun high country weddings. Please contact us with any questions. Videos created by Stacy Sanchez of Breckenridge, Colorado. That's me! In today's post you see a Styled Shoot in Breckenridge, Colorado, with Behind the Scenes in a Video that I shot. I see lots of styled shoots on other wedding blogs, and I felt like some of the off-the-beaten path places in Breck needed the spotlight. That's what makes this blog different. These places get overlooked from the bigger, regional magazines and websites. This is our backyard and we know it better than any other website out there. Please contact us to learn more more about creating a custom wedding package for a destination wedding, elopement, engagement photo session or vow renewal. We're all about the mountain love in all its forms and stages. This video was all created via mobile, and I help locals with New Media Marketing for Colorado Wedding Professionals. As the former owner of Petal and Bean, one of the contributors to the styled shoot, I helped my wife, Dina with numerous weddings over the last 10 years. I took many many photos of bridal bouquets, and learned by doing. I want to help others learn how to create an effective online presence that helps today's brides and grooms in a modern blog and marketplace. Vendors and venues, please contact me with any questions you have, including how to set up a styled shoot at your venue. We plan on doing more of these, so please be in touch with your ideas! Lots of couples discover the Breckenridge Ski Resort and return to find lesser known gems, like today's feature about Horseshoe Gulch: Backcountry Nordic Skiing in Breckenridge, Colorado. Once you've become comfortably downhill and are looking for a way to ski while escaping the crowds, click in to some cross country gear and go exploring. Many of the hiking trails in the Town of Breckenridge are packed down by walkers, skiers and snowshoers during the winter time. Some of them are good for dogs and kids. If you'd like to know more about adding a little adventure to your destination wedding in the Colorado Rocky Mountains, please contact us to start the conversation. We work with numerous venues and vendors that we can then build into a custom wedding package for your gathering. And yes, we work with groups of all sizes and budgets.